A North Atlantic right whale feeds on the surface of Cape Cod bay off the coast of Plymouth, Massachusetts, March 28, 2018. A group of Democratic senators said in an April 25 letter to the National Oceanic and Atmospheric Administration that the agency should conduct a review of Canada's right whale conservation standards, and consider prohibitions on some Canadian seafood imports if they are too weak. The right whales number only about 450, with 17 deaths in 2017 and 12 of which were in Canada. PORTLAND, Maine — A group of Democratic senators says the U.S. should audit the job Canada is doing to protect endangered whales, but the Canadian government and some U.S. scientists are reacting coolly to the idea. The senators said in an April 25 letter to the National Oceanic and Atmospheric Administration that the agency should conduct a review of Canada’s right whale conservation standards, and consider prohibitions on some Canadian seafood imports if they are too weak. The U.S. imported more than $3.3 billion worth of Canadian seafood in 2017. “Determining as quickly as possible whether Canada’s fishermen are being held to the same level of accountability as those in America is a critical step for taking swift action to protect this treasured species,” Markey said. Canada believes it’s making a lot of strides to protect the whales, and also wants to avoid negative effects on the countries’ trade relationship, said Lauren Sankey, a spokeswoman for Fisheries and Oceans Canada. Sankey added that Canada’s government will work cooperatively with the U.S., and that the country just recently introduced new protection measures, such as fishing gear reductions. 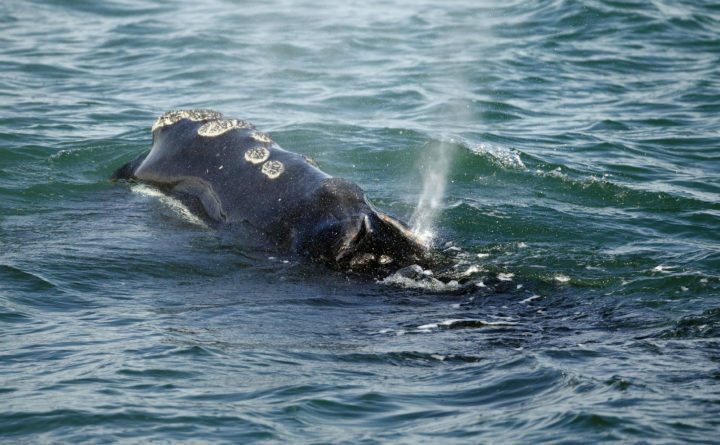 Two of the biggest threats to right whales are entanglement in fishing gear and collisions with large ships. “The new measures we’ve introduced for this season aim to protect these endangered whales from further harm and minimize possible economic losses for the industry and coastal communities that depend on the fishery,” Sankey said. Preservation of the right whale ignited conservation groups and marine scientists in the past year because of all the deaths, coupled with low mortality. Some estimate that the species could be extinct in less than 25 years if it continues on its current course. But Regina Asmutis-Silvia, a biologist with the Massachusetts-based marine mammal advocacy group Whale and Dolphin Conservation, said cracking down on Canada might not be the best approach. It makes more sense to focus on greater protections in U.S. waters, she said. The other senators involved in Markey’s effort are Sen. Elizabeth Warren of Massachusetts, Sens. Cory Booker and Robert Menendez of New Jersey, Sen. Richard Blumenthal of Connecticut, Sen. Kirsten Gillibrand of New York, Sens. Jack Reed and Sheldon Whitehouse of Rhode Island, Sens. Jeanne Shaheen and Maggie Hassan of New Hampshire and Sen. Tom Carper of Delaware. NOAA spokeswoman Kate Brogan said the agency is looking into the senators’ request for a review. “NOAA continues to work closely with Canada to ensure that effective measures are in place to avoid entanglements in both Canadian and in U.S. waters,” she said.